Turns out, all those 'Game Of Thrones' final season spoilers the ultimate GoT fans have been looking for are hiding in a music app. Turns out, all those Game Of Thrones final season spoilers the ultimate GoT fans have been looking for are hiding in a music app. Yes, you read that right! On Tuesday, Swedish audio streaming service, Spotify dropped a playlist called Game of Thrones: The End Is Coming. According to show's co-creators, David Benioff and Daniel Weiss, the playlist is hiding the finale spoiler in one of the 50 songs. "The answer to the ending is one hundred percent hidden in the playlist choices," Benioff and Weiss told Spotify's For the Record. "No one will believe us, but it's true." "We were looking for songs that made us feel the way the show made us feel," the creators added. "There’s variety in there—Rage is not Johnny Cash. But they both have a deep inherent power." Some of the songs featured on the playlist include POWER by Kanye West, Direwolf by Grateful Dead, Rise Above by Black Flag, Immigrant Song by Led Zeppelin (which has been a Spotify hit since 2017's Thor: Ragnarok), Winterlong by Neil Young, and perhaps too on the nose, Seven Nation Army by The White Stripes. 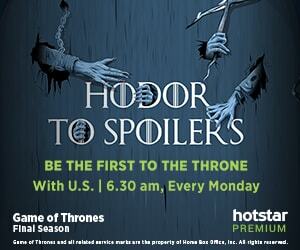 Game of Thrones is set to premiere exactly two days from today and all eyes are set on who will claim the Iron Throne. With so many characters and plot lines, each converging into the the other, the ending is bound to get complicated, and the biggest challenge for the makers remains how to devise a befitting climax to a show that has been almost a decade in the running. The finale season will consist of seven episodes in total, and will pit the White walkers, lead by the Night King, against all the living souls. It remains to be seen how the much-talked about ending shapes up. The first episode of Game of Thrones Season 8 will air on April 14, (April 15 in India).